Top of the list is the tower tour which, for a small fee, takes you to see the amazing view. However, there is no lift and climbing the stairs is hard work, but you are certainly rewarded when you get to the top. Make sure you go on a clear day to get the best view. Secondly, take the opportunity to enter the public areas of City Hall which are free. We enjoyed wandering through the grand corridors and were particularly impressed with the large central hall where civic events are held. Also, make sure you spend some time in a little oasis in the centre of the building. It’s an attractive and peaceful garden, which can be accessed directly from outside via an archway on the side opposite Tivoli Gardens if you prefer. Thirdly, City Hall houses an Astronomical Clock in a special room just inside the foyer which you can see in action for a small fee. Another notable feature at City Hall is the statue of Hans Christian Anderson outside. 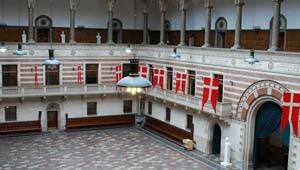 Copenhagen City Hall is open Monday to Friday from 8.30am to 4.30pm and Saturday from 10am to 1pm. Tours in English take place Monday to Friday at 3pm. Tower admission is at 11am and 2pm Monday to Friday or noon on Saturday. Adult tickets to go up the tower cost 30 DKK (2012 prices).